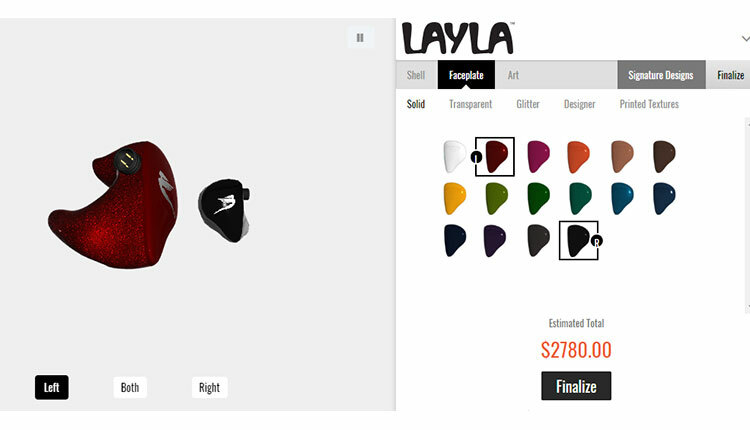 Disclaimer: The JH Audio Layla Signature Design Series CIEM sent to us for the purposes of this review is a paid for unit and does not have to be returned. Thank you to the team at JH Audio for giving us this opportunity. The Layla has been out since 2015 so a lot of people will already be familiar with JH Audio’s flagship creation. However, for us here at Headfonics, this is the first time we have officially reviewed a JH Audio product so in a way it is new for us. Now previously, I had a dalliance with the Roxanne universal for a few years which I picked up locally from one of our group members and I liked it a lot. However, being a universal and a big one at that the fit never quite worked for me. That was when we decided that the Layla review had to really be a custom monitor to hear it at its absolute best. I am glad we went down that route because the choice to use the Luthier Signature design has resulted in literally the best-designed custom monitor I have ever received. This is my 23rd CIEM received for review in a 7-year period so that is no knee-jerk reaction either. The flagship Layla is a 12 balanced-armature driver custom monitor with an integrated 4th order crossover technology unique to JH Audio. The driver config is pretty balanced with quad driver arrays for low, mids and highs per side. There are a few things unique to the performance series which over the years a lot of customers have found useful and one of them is the variable bass output module on the cables used with the Layla. You can find them also on the Roxanne right down to the JH13V2 Pro series and always with their custom 4-pin connector technology. The general summary is that the module boosts or attenuates the low-end by up to 13dB to allow you a measure of customization on the go. The other unique feature is the use of fourth crossover technology inside the Layla. Generally, most multi-BA driver designs will use a three-way active crossover to even a response curve on overlapping frequency ranges typical of a multi-BA driver design. The 4th order crossover takes a different approach by steep crossover slopes and less of an overlap to improve the IEMs phasing and generally produce a far more linear and cleaner response. Something entirely unique and patented with JH Audio and the Layla, in particular, is their freqphase technology. At a basic level, JH Audio contend that typical multi-driver monitors with different time signatures, positioned in parallel at the front, need to account for timing using distance as a factor. If these designs use equal length tubes and they are not staggered in time you will get serious cancellation issues at the crossover point. These issues cannot be fixed with equalization or simply moving the crossovers. With freq phase the low, mid and high BA drivers are positioned differently with different tube lengths to account for the speed of each driver, particularly the highs. Check out Jerry’s own demonstration video below for something a little more in-depth on freqphase. The final pitch and the one I think will grab your attention right away when considering to go custom is the Luthier design itself which is just outstanding. This is a Bacote wood shell using a Damascus plate with their signature FlyGirl logo on top and wrapped in a gold band. Now I am used to wood in custom designs but this is an entire shell of layered exotic wood which is first for me. If ever there is a pitch to go custom this is it. The whole design is also made a lot easier by one of the coolest online design tools I have seen for CIEMs. Buying made simple is a powerful weapon. While having an online custom design tool is nothing new the JH Audio designer is unique in that it draws from an AutoCAD legacy and gives you a true 3D perspective on your design. The best ones I have seen to date from the likes of 64 Audio are as detailed in the options section but the imagery is quite flat or 2D-like so you cannot see the full impact of the design you are choosing. Now you would not think that a huge deal if you have not used the JH Audio version but it actually is. Being able to see both the back and front as well as twist it around gives you a much deeper perspective on the final design look and feel. You can also focus on either the left shell or right only or both at the same time when you start designing and flick in between as you go about customizing your final look. When you click both the tool will bring both into focus showing you the progression of each shell without disrupting your creativity flow. The builder offers you no less than 45 different shell options and 11 signature designs. The non-signature designs are arranged into familiar categories for those who have done customs before including solid, transparent and glitter. You do have an additional designer series where you can opt for a carbon fiber or “Lighting Strike” body solid design. If you choose these you will not be able to pick your plate designs as it is an all-over finish. You can, however, choose a pre-set JH Audio artwork graphic or upload your own onto the body solid design. If you opt for a regular shell design then you have access to a whopping 76 different faceplate designs ranging from solid, transparent, glitter, designer, and printed texture creations. Some of the creations are excellent including carbon fiber, wood, pearl or titanium to name but a few. You can then finish off your design with either a pre-set JH Audio artwork graphic or upload your own unique picture or design to put the final touch on the faceplates. There does not seem to be any additional charge for the artwork either. Speaking of charges and prices there is a running total at the bottom of the designer tool that changes according to the options you choose. It is pretty much the same as any other designer tool in that regard though I would like to have some indication of the prices before I pick my options. Some of the design and plates will set you back a fair whack such as the Lightning solid body at $257.50 on top of the base price of the Layla. That is what I like about the Luthier Signature design. It is locked and loaded with a fairly fixed price. Now if you have chosen the Luthier edition from their information page then when you click to buy the online design tool automatically loads up every aspect of the Luthier design for you which makes the whole process so much easier. You can also access the Signature design series by simply clicking on the “Signature Design” menu option on the top right of the customizer system. The only irony of the pre-loaded signature designs on the customizer tool is that you cannot rotate them as you would in creating any other custom design from JH Audio. That being said you do get a picture of the actual final design which is very accurate to what you will receive. When ready the store prompts you to ‘finalize’ your order. Here you get to choose the cables which are either in clear or black 49″ or 64″. The 64″ will set you back an additional $10. If you selected any CIEM that uses the variable bass module you will only have the option for the 4-pin connectors. Those ordering the JH11 PRO and below will be offered a 2-pin 0.78mm cable with the same lengths and pricing or the option to upgrade to the 4-pin 49″ in clear or black for an additional $155. The final add-on and another free of charge one at that is the ability to engrave whatever name you want on the carry-case. Given the quality of the case and the fact I think you will be using it a lot this is something worth doing right. The Layla packaging is tidy, distinct and well made. In particular, the carbon fiber and black aluminum carrying case with its protective outer wrap and magnetized lock. 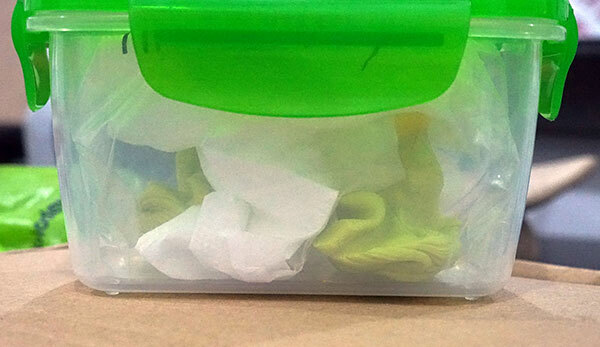 There is a ton of room in there for your customs, cable or two and the little bass module screwdriver. If you want something even more low-profile then there is an additional black soft pouch that comes as part of the accessory kit. As with most CIEM packages, you do also get a small wax cleaning tool as well as a small desiccant pill box for moisture absorption. The Layla is also packed with some soft wraps. Now, why on earth would you need these if they are custom? I cannot say I will personally need them with my fit but it may well be that you may find them useful if your ear is prone to sweating or if there is moisture which may make the CIEM a bit looser. 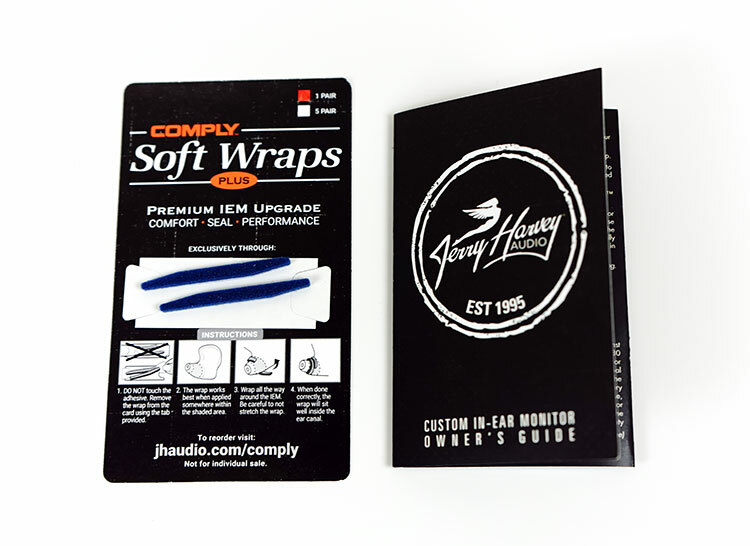 These are designed to simply wrap around the nozzle and give you an “additional layer” of seal and comfort. Just 11 days. Ok, I am very impressed and I am told also this is not because it was a review sample this was, in fact, quite normal. I would be keen to hear if Layla owners got the 10-12 day treatment also but if that’s the norm that is the fastest turnaround time I have had a set of custom monitor designs made for me. Given the quality of the finish and layering on the wood it is doubly surprising. FedEx took almost as long to deliver it! Note there is a rush service available if you want even shorter than that but I am sure you will have to pay a little more like most other rush services. I would say don’t bother, 10-12 days is outstanding for me. 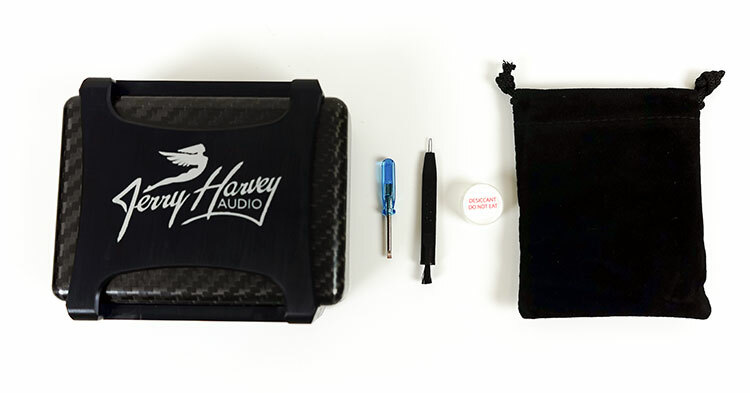 The final part is really after you place the order and that is getting a set of ear molds over to JH Audio. The company has provided a very useful help section at the bottom of their webpage which marks out preferred audiologists in the US, UK, and AU for doing your ear impressions. If you are outside of that area they also provide you with a handy guide you can download, print and hand to your local audiologist to follow in making your impressions. For some reason, I could not find the impression tip guide easily on the website but you do get it once you have your ordered confirmed via an email link. Here is the link though for those who want to get it sorted right away. Do not take shortcuts on the ear impressions as the shells of the Layla are quite big and they will need a full impression of your ear beyond the second bend and the full outer ear to work with. JH Audio prefer an “open-jaw” impression which will require a bite block during the curing process which is about 4-5 mins. Once done and confirmed, pop them in a hard container like in the picture above and send them to JH Audio via your courier of choice. Hi Desmond, perhaps I can suggest the Cayin N5iis or the new iBasso DX120? Both are small, under $500, good clean sound. The N5iis might be the quieter of the two but we have not had enough time with the DX120 to say that definitively. Much deeper sounding and more spacious also. This review is about the build and looks and not any detail of how they sound with what tracks you listened to and what was your source DAC and type of amp (tube/soild state) . This style of review is feeling like a marketing peice vs an audiophile review. When I listen to IEM’s or gear I have my go too file list that I know inside and out to evalute gear at say RMAF. When I read acar review I look for same benchmarks like 0-60 or quarter mile. 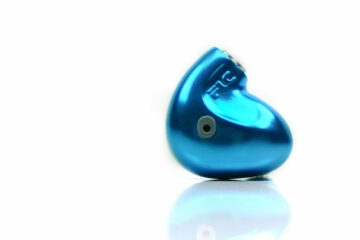 I beleive that Jerry Harvey makes some very good IEM’s but raise the bar on reviews. Tyll Hersten at Inner Fidelity had a set list of tracks and procedured that he went through to bechmark the gear he reviewed. Hello, Rick thank you for visiting us and putting your 0.02c in. For each and every custom review we do we always start with the process and build because that is what makes custom monitors unique to universal and one of the main reasons why people choose to go that way. What we reviewed here is the Layla Signature edition and not the universal or standard edition because its the first custom monitor ever to use a fundamentally wood shell and not just a plate. It is only right for those who wanted to know more about the Signature series what the big deal was about it. Second, we have an entire page on the sound including all sources used and recommendations on what to pair the Layla with (page 3 – matchability and second half of page 2). And third, in all our comparisons, we have advised which genre of music suits which model better based on their performance with reference to artists in the review. You will find that at the bottom of each comparison. Your car analogy is interesting because those are specifications equivalent to say how much elevation there is at the 5k mark for treble between 2 monitors. That’s the equivalent to a car performance spec. Good review, been thinking about this or the 64 audio U18 so it helps a lot. Damned if I can find many Layla reviews knocking around – ayos!! I think if universal I would favor the u18 over the universal Layla as the size is not for everyone. But for customs that should not be an issue since they are both going to fit perfectly (in theory). My initial impression of the Layla custom was very big and tight but after a few goes it fits really nice now, not sure why, either my ear expanded or the wood shell shrunk a bit? Yeah, but my big thing is soundstage so a bit worried the Layla won’t give me as much as the LCDi4. I get the whole outdoors thing though so just tryin’ da balance it all out. thanks anyhow, will keep an eye out for your i4 review. Thanks for the review, well laid out and easy to follow. Will you be comparing this to the LCDi4 when the review comes out? I am deciding between this and the LCDi4 and not sure is an open design is for me. I can compare it but for me the LCDi4 is a very different beast to the Layla. That open back design is the polar opposite of the rock-solid isolation of the Layla.